City Network Review 2019: Is City Network a Good Hosting? If you're looking for a cloud server to host your website, City Network offers their scalable public, private, and hybrid cloud services with pay-as-you-go pricing. Their services are great for those wanting complete control over their web hosting, but if you need support, be prepared to pay for it. City Network is a Swedish provider of IT infrastructure services. They provide a wide variety of cloud solutions, including their pay-as-you-go public cloud services. Their plans offer scalable features with 1TB of monthly data transfer along with 1Gbps bandwidth per server and a 99.95% uptime SLA. 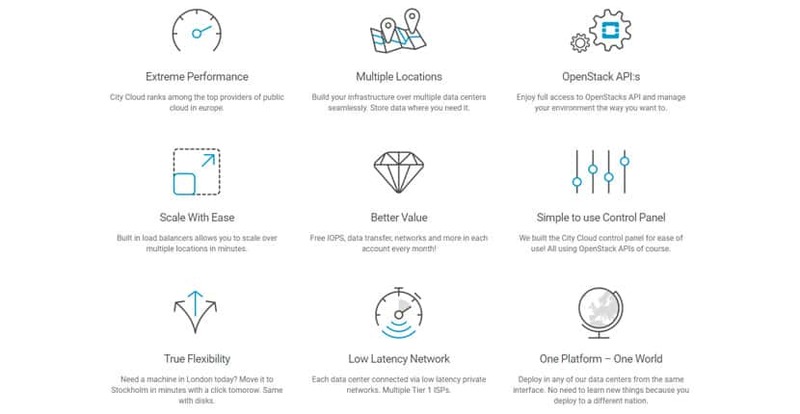 City Network offers public cloud servers with scalable options and guaranteed 1TB of transfer monthly. Users get a minimum of 1Gbps bandwidth per available server along with the assurance of a 99.95% uptime SLA for their public cloud services, meaning you should experience few outages if any. Whether you want a reliable cloud server for a single e-commerce store or perhaps a network of websites, these servers should fit the need. Note that a public cloud server is not shared hosting, meaning you must know how to administrate your own servers. If you don’t know how to manage a server, this is not the solution for you. For those that have the right skills, you should have little problems with this product as they offer a simple-to-use control panel using OpenStack APIs. City Network has multiple data centers around the world, so you’ll be able to select accordingly from their European, Asian, American, and Middle Eastern locations. But fret not: you won’t be locked into a single location. If you need to move to a different location at any time, you can do so within a single day at the click of a button. City Network offers public cloud server plans that allow you to pay as you go. You can purchase resources by the hour or by the month. The rates for their European and U.S.-based public cloud services are fairly decent by market average, but their single Tokyo-based network is priced a little higher. Their Dubai network is the priciest of the lot. Note that compared to shared hosting, cloud hosting tends to be more expensive because of the greater reliability and built-in redundancies: City Network’s plans have followed this trend. All of their plans are customizable and allow you to add any number of additional features for a fee. Added features include block storage, disaster recovery, object storage, additional data transfers, operating system installs, VPNs, load balancers, and more. If you’re looking for support with these plans, be prepared to pay for it. The only free help you get with these plans is access to their knowledge base, their service status updates, and email support with a 24 hour response time. To receive standard technical support, you’ll have to pay a substantial monthly fee. Cloud servers are not intended for beginners, so you’re expected to know how to administrate your system. If you’re in the market for a cloud server, then City Network’s public cloud is an excellent option with fast speeds, robust bandwidth, and scalable options. However, you will need to budget for support as their free support is limited. Wondering how City Network stacks up against other Web Hosting companies? Enter any other Web Hosting company and we will give you a side-by-side comparison.